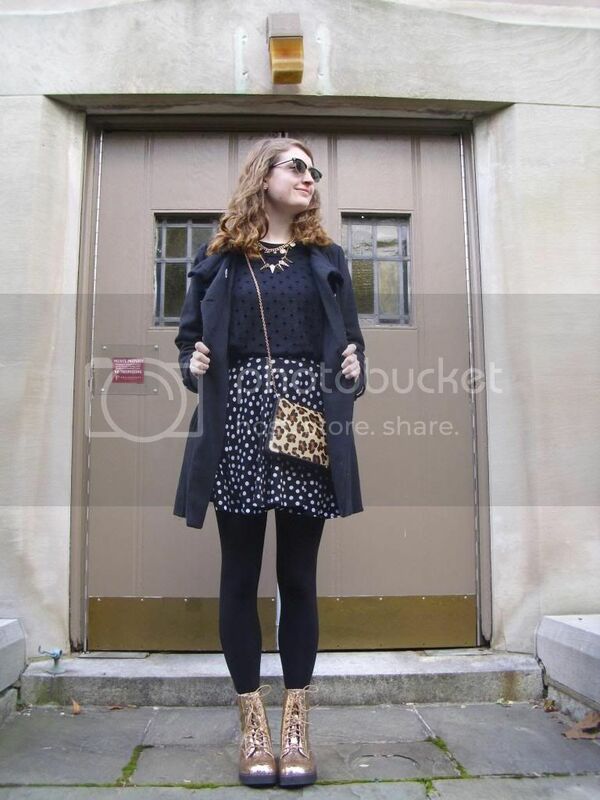 Today, I styled my outfit around my black and white polka dot circle skirt. Although I've only had this skirt for a few weeks, I've already worn it quite a few times. The versatility of the print of this skirt combined with the stunning shape of the skirt simply draw me to wear it time and time again. Today, I abandoned color completely and simply paired the skirt with shades of black and of gold. Due to chilly temperatures outside, layering was my best friend today. I began by pairing the skirt with a black cropped tank top followed by a black, open knit sweater topped off by a large black winter coat. I also slipped on a pair of black opaque tights. I invigorated my look with golden accessories and even golden shoes. 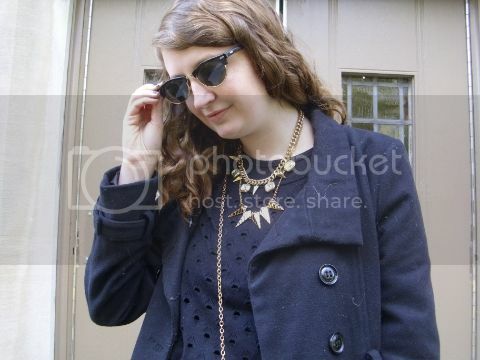 The first accessory that I threw on was a short, golden spiked necklace. This necklace is sold by ShopLately and is the "Bitter and Sweet Chain Necklace." It retails for $16 + free shipping HERE. The juxtaposition of the sweet diamond charms and edgier spiked charms has me continually reaching for this necklace. I decided to switch things up today and layer the necklace with my new necklace courtesy of Whimsy Accessories. The necklace that I am wearing (the second, longer spiked necklace) is "The Black & White Rivet Geometric Necklace" and retails for $18 + free shipping. You can check it out HERE. I am very pleased with this necklace; besides being a great piece to layer with other necklaces, it is very good quality, easy to style and trendy. Who could say no to that combination? I am very impressed with Whimsy Accessories overall and would definitely recommend checking Whimsy Accessories out HERE. Other than necklaces, Whimsy Accessories also sells brooches, bracelets, earrings and rings. "Qupid SOURCE-03X Glitter Combat Boot" sold by ZOOSHOO. They retail for $47 + shipping. You can find them HERE. These boots also come in navy but I much prefer the "champagne" color. The second that I spotted these boots on ShopLately, I fell in love and when they came in the mail, my love for them only deepened. To my delight, the quality of these shoes is wonderful and I believe that these boots will last me quite a while. Also, not too much glitter has fallen off yet so that is definitely a plus. 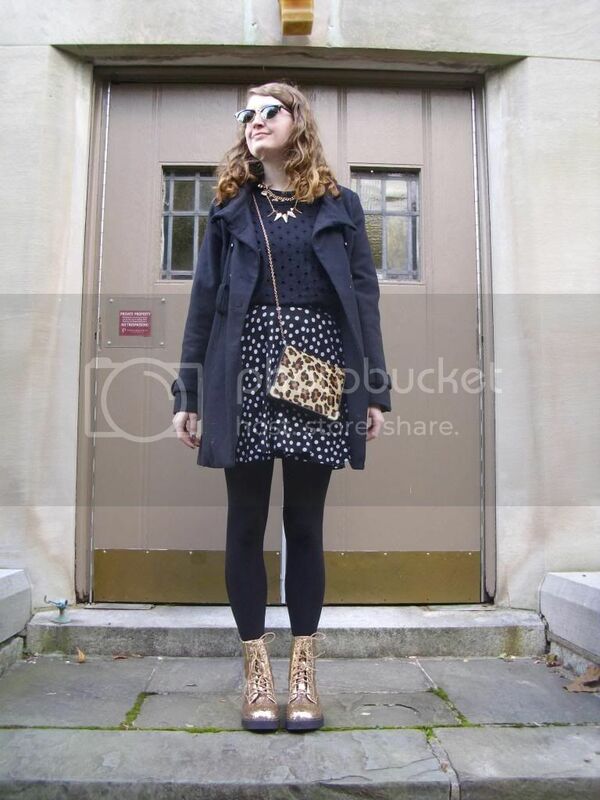 I wrapped up my look with a pair of classic sunglasses and my leopard crossbody bag. I hope that you guys all enjoy your weekend! Awesome boots, they look so good with your outfit!